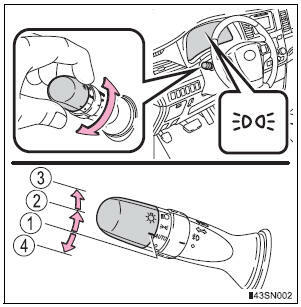 Turning the end of the lever turns on the lights as follows: The illustration is intended as an example. 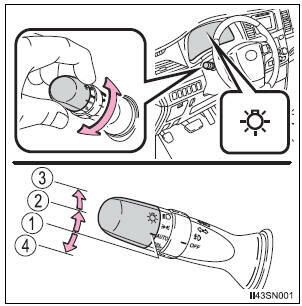 parking lights, daytime running lights (if equipped) and so on turn on and off automatically (when the engine switch is in the “ON” position [vehicles without a smart key system] or IGNITION ON mode [vehicles with a smart key system]). tail, license plate, daytime running lights (if equipped) and instrument panel lights turn on. lights listed above (except daytime running lights) turn on.